To begin working on your BoldGrid site, you will need to log into the BoldGrid Admin Dashboard. Below are simple instructions on how to do that. Visit your site by adding /wp-admin to the end of your domain name. For example, if your domain name is example.com then you would type example.com/wp-admin. This brings up a screen where you will enter your username and password. Once entered, click on the Login button. You are now logged in and taken to the main dashboard screen. From here you can continue to create or modify your BoldGrid site! If you are not a current customer of InMotion Hosting and need assistance with BoldGrid, you can visit the BoldGrid Support Center for more information. For more information about logging into BoldGrid please visit the BoldGrid site here. How do i get official host premium key? I am inmotion shared business pro hosting customer though. The BoldGrid Connect Key that is located in your Account Management Panel is indeed a Premium Connect Key. You can find your Connect Key in AMP by following these instructions. I have tried setting up BoldGrid but I get "Error 404 File Not Found" when I follow the link. This would be for expertfamilytravel.com (working offline/temporary site). I do not see a 404 error when going to that link, however, a 404 error means that the file path you are looking for does not exist on the server you are looking at. I would ensure you have the domain pointed to the right server and that your .htaccess file is correct as some URLs in BoldGrid/WordPress will not work if the .htaccess is invalid. I'm having trouble logging into BoldGrid. I receive a message saying "this site cant be reached"
Try checking with the domain registrar to make sure the domain is properly pointed to the name servers where you are hosting your BoldGrid website. 404: Page not found This error is generated when there was no web page with the name you specified at website. I recommend checking with your domain registrar to make sure the domain is properly pointed to the server/name servers where you are hosting the BoldGrid/WordPress website. I am unable to login to BoldGrid. It seems to recognize my email address as the Username but not the password. It pre-installed so I do not know what password would be assoiciated with Wordpress. The password I use for AMP does not work. I tried the forgot password function and nothing arrives in my inbox. Yes, you should have received the login information in the Welcome email. If not, we have a full guide on how you can reset a password for a WordPress site. (BoldGrid is built inside of WordPress.) If you are still having trouble, feel free to contact our Live Support team. It sounds as if BoldGrid did not install properly. Whats your domain name and we'd be happy to look into it further for you. Thanks for the information about the .htaccess file. My main page works correctly with it renamed, or with its original name. I don't see any files or folders corresponding to the BoldGrid test area though, so my gut feel is that the installation tool didn't complete correctly. What I might try next is moving my main page into a sub-account, then setup the Bold-Grid area as the main account and see if that works. Whats your domain name, it's easier for us to look into this if we have more information. I already have a website on the domain and would like to keep it running while I try creating a site with BoldGrid. To do this, I used the BoldGrid testing option which is supposed to operate in a sub-domain on the site. The installation looked like it went ok, but when I try to login using mydomain.org/wp-admin I get a 404 not found error. I'm not sure if the installation failed or if the login is not working. I recommend testing your .htaccess file, since it handles rewrites and redirects. This is easily tested by renaming your current htaccess file. Often, during troubleshooting, I'll simply rename the .htaccess to .htaccess.old and now I'll reload the website. If the site loads I then know the issue resides in my configuration of the .htaccess file. If it does not fix the issue I was having, I'll rename the htaccess by removing the .old I added to the end. That way, it won't affect my website after I resolve the issue. My web browser says that the log in is not secure and suggests that I do not log in this way. How do I secure the connection so that my log in info is not vulnerable? You would need to have an SSL certificate associated with your site. SSL is used to encrypt connections between the server and the client (your computer attaching to the server). Check out this article for more detail. Please fix this so I can securely log in to update my website. Belinda, what is your site that you are seeing this issue on? How about a simple "old school" flow chart to show how to get into BoldGrid. I have found several different posts but after trying each I still am not able to get to where I can actually start designing a website! The online videos (one that proposes to represent InMotion) shows things that are not actually on InMotion at the present. JW, what part of the process are you getting stopped on? I'm having trouble logging in to BoldGrid. Which logon and password should I use, the admin, the support center logon or the email logon? 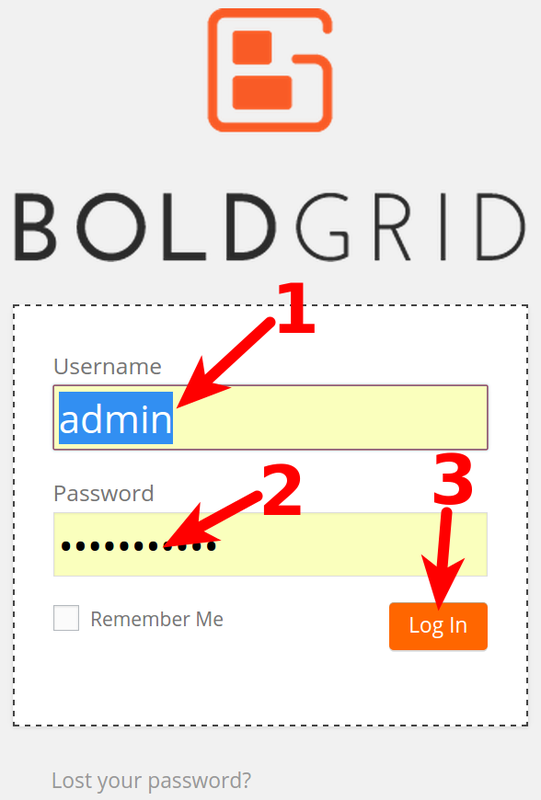 BoldGrid used your WordPress username and password that you created when you set it up.